Netgear WNCE2001 universal WiFi Internet adapter allows you to connect HDTV, gaming console, Blu-ray player or other network device with Ethernet port to WiFi network easily. The main advantage of this Netgear WNCE2001 adapter is no messy cabling involved on connecting those network devices to wireless network. In addition, it works on any network device, and so you don’t have to buy wireless adapter that will only work with one type of device. There are two ways to power up this Netgear WNCE2001 adapter, you can power up by using power adapter or via USB connection to network device. How to make it works? You can set it up with WPS (WiFi Protected Setup) or manually. If your wireless router supports WPS, you can press the WPS button on this Netgear WNCE2001 adapter once it’s connected with network cable to your network device (HDTV, Xbox360, etc), after that press WPS button on wireless router to set it up. If you want to configure this Netgear WNCE2001 adapter manually, first you need to connect it to computer with network cable, open web browser and follow instruction to configure the adapter. 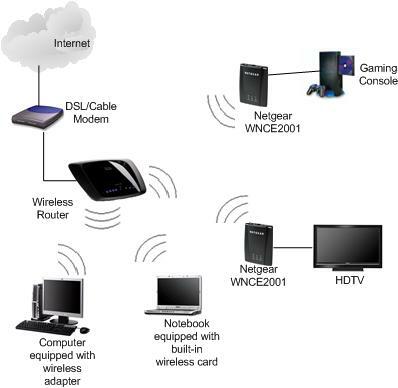 Once it’s done, reconnect the adapter to HDTV, gaming console or Xbox 360 in order to connect to wireless network. 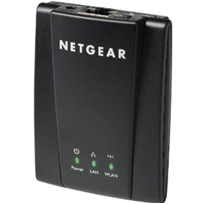 Click here to get more information about this Netgear WNCE2001 universal WiFi adapter! Excellent product, very easy to setup and use. Glad someone found how to make a device that will allow electronic devices that can only take ethernet connectiion but are far away from a Router and running a Cat5 Cable is not an option. I have Replay TV DVR that only takes ethernet cable to update TV Guide and due to this I was stuck with using this unit only at a location where I had access to ethernet cable, I bought the Netgear WNCE2001 and now I am able to use my Replay TV anywhere around the house. I also tried connecting this to a 24 port switch and was able to plug in devices into the switch and access internet...so in essence it made my 24 port switch into a 24 port wireless switch. WOW! I purchased the Netgear Universal Wifi Internet Adapter today and I was a little hesitant because it less expensive than other similar devices I've seen. Once I got home I opened the package and my Mac computer was connected to my WiFi Connection at home within minutes, so simple to set up. You can do a WPS automatic Connection if your wireless router supports that feature or you can set up the device using your computer (which is how I connected my device). I powered up my device and then connected the included ethernet cable to my Mac and opened the browser. The Netgear setup screen appeared and showed all the wifi networks available near me. I selected my network and less than a minute later I was connected. I suggest you connect the device wherever you're going to use it so you won't have to unplug and move the device like me. I purchased this adapter to connect my Samsung Blueray Player to the internet. Works perfectly, watching Netflix Streaming Movies and Listening to Pandora with no problems. Good range with this device as well, my wireless router (Belkin) is on the second floor of my house and the Netgear Internet Adapter is in the basement, works just fine. I purchased the Netgear Universal WiFi Internet Adapter hoping to hook up a new DVD player with internet capabilities, where I did not have a ethernet connection available. Set up was easy and it quickly found and configured to my router. I have a Cicso N router that gives me great coverage. Once connected, the Netgear Universal router indicated it's signal strength was poor (showing a red light). This surprised me as I have great signal strength throughout my house and a Samsung wireless USB plug next to it has great signal strength. The only time it would show a green ligth (strong signal connection) was if it was in the same room as the router. Since I was not sure if this was the fault of this one unit, I ended up returning for a refund. This product works exactly as stated in the advertisement. The reception is great. My router is in my basement and the Netgear product is upstairs in the back of my house. No lag at all. I'm running a wireless network via Apple Airport Extreme. I tried using this gadget to connect my LG TV (with Yahoo Widgets) to the network: no problems. Setup was a snap. I then tried using this on my DirecTV DVR for Video On Demand: again, no problems. I was expecting to get lag while watching streaming movies, but I saw no real difference between connecting via CAT5 and the Netgear WNCE2001. I really can't say much else about this little gadget. I am impressed. Addendum (Nov. 2010): I've now used this little gadget on 5 separate computers, 2 TVs and a DVR. I even used it as a bridge to get an old Nintendo DS Lite to connect to a WPA2 network. Once you've set it up, it remembers. Since the devices you connect it to think they are using a wired connection, no additional set up is needed. I LOVE this gadget! Instant wireless!